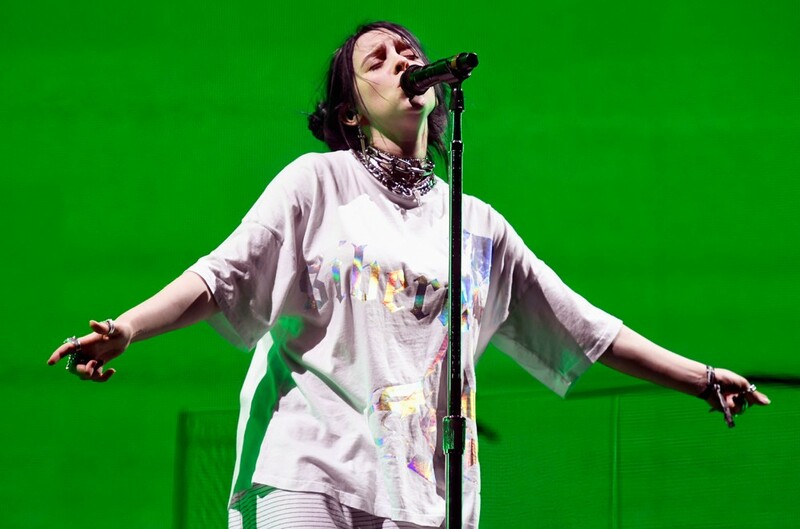 Billie Eilish is a documented, devoted Belieber, and this weekend she got the chance to not only meet Justin Bieber, but to jam out with him to *NSYNC's surprise performance during Ariana Grande's headlining set at Coachella. The currently-reigning queen of the Streets Talkin 200 played the festival on Saturday night (April 13), but she stuck around to check out the music on Sunday (April 14) from the VIP section during Grande's performance. There, she found herself standing next to Bieber, who is one of her favorite artists — and she promptly freaked out. Her reaction was understandable: Eilish told Streets Talkin back in March that she couldn't believe it when he followed her on social media, and that a collaboration with him could be in the works. She's clearly still reeling from her newly established friendship with the pop star, as this clip of the two of them hanging out in VIP at Coachella is any indication. Bieber stares at her until she basically curls up into herself and crouches low to the ground, before the two burst into giggles and hug, and later they dance with James Corden to "Tearin' Up My Heart," which *NSYNC tore through with Grande much to the crowd's delight. Eilish had more than one dream come true at Coachella, apparently. Watch footage of Bieber and Eilish's NSYNC singalong moment here.